Last Sunday I set my first fitness challenge of 2015. My challenge was to have at least 20 active minutes a day on my FitBit. I read that doing 20 minutes a day is a great starting point to help keep yourself fit and healthy. This is going to be a regular segment on my blog now and I'm excited to get fitter, healthier and lose some weight. My first challenge started on Monday 9th March and ended today 15th March. I am super happy that I was able to reach my daily target. Some days were easier than others but I'm glad every day I did a lot more than the minimal 20 minutes. I'd walk more, I went to the gym one of the days and did some weights. These are my steps for the week, I'm pretty impressed that only met my targets all week apart from Friday (13th). It was a pretty bad day for me overall. I had an assignment due at university and the day just went bad to worse, I understood why it was Friday 13th that day! I'm unsure why my active minutes are so high for Friday 13th. I think maybe because when I was active I was running around like a headless chicken! Of course today isn't over, it has barely started and already I've done 5432 steps and 20 active minutes. I just went shopping and walk about while picking some things up for dinner. Have you recently set yourself any fitness challenges? Do You have a challenge for me to take next week? Well done and keep up the good work :-) It's always fun to have a challenge to stick to. I have set very many fitness goals lately. I should though. Good for you that you met all your target, keep up the good work. 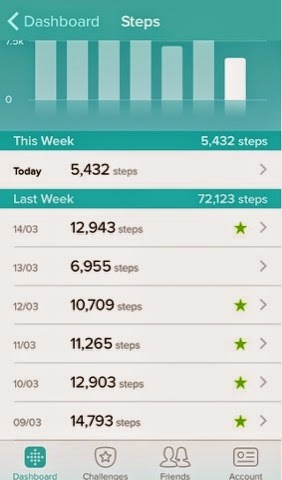 well done dear... 5k steps in a day... great job! It's a really great thing that you reached your target. :) Keep up the good work. Wow!! That's a great app to track your fitness ! I'll surely try it out soon. you have been done so great! Well done and best of luck for next. I really need to start mine soon, don't know for how long I was just planning.. sigh, lazy me! Thats some fitness companion I would love. Well Done girl, way to a fitter you. Wow... congratz!!! But i think you will still continue although challenge end. It is good for health..